Select meat that is pink with white (not gray or yellow) fat. Cook within 3 to 4 days or freeze up to 3 months. Due to high fat content, even properly-frozen spareribs can deteriorate rapidly and turn rancid if not used timely. Plan on 1 to 1-1/2 pounds per person when purchasing spareribs. Remove the thin membrane on the backside of the ribs before cooking, if the butcher has not done so. Loosen a corner with a sharp knife, grip tightly and tear from the ribs. General baking instructions: bake at 325 F for 1 1/2 to 2 hours. If you plan on marinating the ribs in a liquid or spice rub for more than 4 hours, choose a marinade with very little salt. The salt will begin to cure the ribs resulting in a flavor more like ham or bacon. When finishing spareribs on the grill, add the sauce during the last few minutes to avoid flare-ups and burns or just after removing from the grill. If you wish to use your marinade as a basting or baking sauce, be sure to boil it for about 5 minutes before reusing. 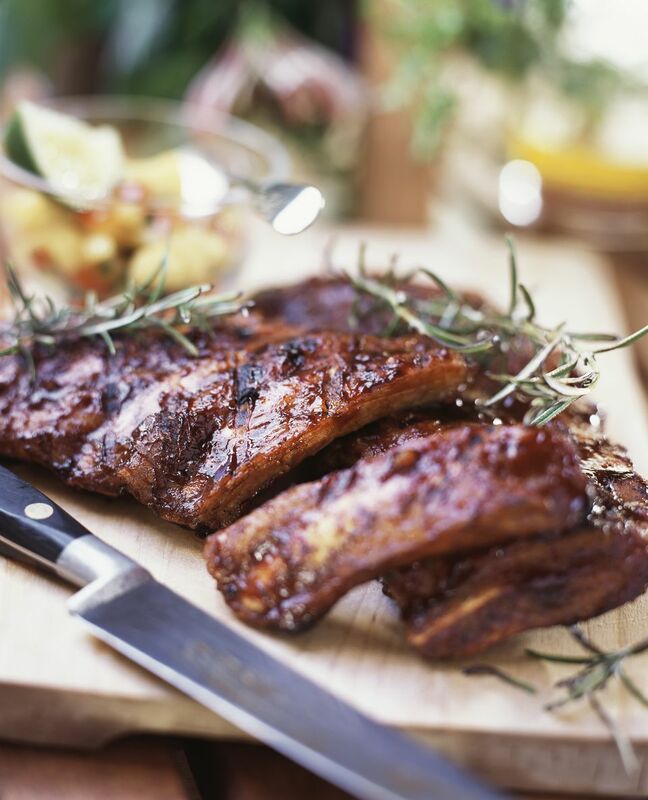 When oven-baking, place the ribs on a rack inside a baking pan lined with foil so the fat can drip off. When the ribs are done, the meat will shrink back from the tips of the bones and the bone should wiggle easily in the meat. In general, plan on at least 1 1/2 hours to braise ribs. For baking, plan on 1 1/2 to 2 1/2 hours. The large end of the rack will generally have more meat. Baby back rib and sparerib recipes can be used interchangeably in most cases. How Do You Grill the Perfect Ribs?